Fluoroscopy using a low radiation dose mini C-arm has many advantages. Manipulating and positioning the injured arm in order to obtain the necessary images is easier. It is more efficient and safer than traditional X-rays since it uses less radiation, and now researchers at Maimonides Medical Center have shown that fluoroscopy is better at diagnosing ligament injuries in the wrist compared to traditional x-rays. The study was presented at the American Academy of Orthopedic Surgery Las Vegas. Dr. Choueka now uses fluoroscopy almost exclusively for diagnosis of these conditions in his office. “There’s less radiation, no processing time, and it allows perfect positioning of the wrist to make an accurate diagnosis.” The research showed that gaps in the bone as small as 2mm could be diagnosed with the fluoroscopy and not with standard X-rays. 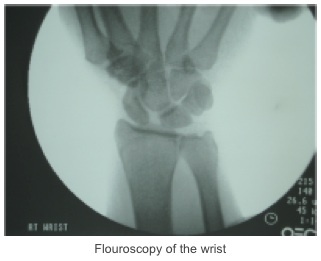 As for the use of fluoroscopy in other areas, Dr. Choueka says, “it has become an invaluable tool for the safe accurate diagnosis of innumerable conditions in the upper extremity.” It is used to diagnose fractures, ligament injuries, look for tumors and makes comparisons to the other arm much easier. For kids, it makes the X-ray experience much easier and even fun since the kids can see their bones moving on the screen. Please send us your Fluoroscopy better than x-rays in diagnosing certain wrist conditions questions or any questions to our friendly staff via our online Contact Form. You may also contact us at or visit our office at 6010 Bay Parkway, Brooklyn, NY 11204.